← Is ENSO “responsible for recent global warming?” No. Four members of the New Zealand CSC, namely Bryan Leland, Vincent Gray, Owen McShane and Greg Balle participated in the ICSC’s inaugural project: a campaign to discredit the 2007 U.N. Climate Change conference in Bali. That campaign also featured an anti-Kyoto letter secretly organized by current ICSC Executive Director Tom Harris, and signed by several ICSC and New Zealand CSC advisors, including Bob Carter and John McLean. All three of the JGR paper authors, John Mclean, Chris de Freitas and Bob Carter, are advisors to the ICSC. In all, the New Zealand CSC team provides the ICSC with six science advisors and two policy advisors (John McLean and New Zealand CSC founder Owen McShane). As well, the five-member ICSC adminustrative team includes two more stalwart New Zealanders: Terry Dunleavey serves as an ICSC director, while Brian Leyland is ICSC Secretary. Registration information for climatescienceinternational.org and nzclimatescience.net shows that the two websites share a common host IP address (68.178.254.234 at GoDaddy). And the domain names were even registered on the same date (May 14, 2006). And that’s where today’s story really starts: with the May 2006 founding of the New Zealand CSC, the first of the “climate science coalition” brand. (There are now no fewer than four of these coalitions, including the brand new Climate Science Coalition of America, under the chairmanship of Roy Spencer, of which more another time). This week saw the birth of an entirely new lobby group aimed at easing the public’s fears about a climate change apocalypse. The New Zealand Climate Science Coalition is a group of scientists who have nobly taken it upon themselves to make certain SUV drivers, coal-fired power station owners and dairy farmers feel good about potentially frying the earth. When not assisting right-thinking scientists to engage in climate change denying discourse, Mr McShane is also the director of the Centre for Resource Management Studies(CRMS), a small think tank aimed primarily at making the Resource Management Act more ‘business friendly’. The chairperson of the CRMS and one of two trustees is a Mr Alan Gibbs. Scoop asked Mr McShane if that was the same kiwi entrepreneur Alan Gibbs that was recently famous for inventing the Aquada – a car that runs on both land and water. Mr McShane confirmed to Scoop that it was indeed the very same Alan Gibbs. Interestingly it turns out that Mr Gibbs is not only the man behind the Aquada but has set his sights on creating something with a little more grunt, namely the Humdinga. 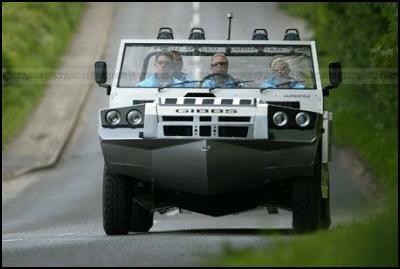 According to promotional material the Humdiga is an SUV/4WD amphibious vehicle powered by a 350 BHP V8 engine, capable of 160 kmh on land and on water. A Week of It reckons it’s just the sought of vehicle a Climate Science Coalition member would feel happy to own given that even if the climate is changing it’s probably caused by sun spots. “ACT is the only Party with the guts to do what’s right for New Zealand, and I think it’s fantastic that the Hon Sir Roger Douglas is coming back into active politics,” Mr Gibbs said…. ACT Leader Rodney Hide welcomed the donation…. Before 2008, ACT New Zealand appeared moribund, and was down to one seat. But what a difference a year (and $200,000) can make. The party won five seats, and even more importantly, was given two ministerial level posts by the new minority National Party government. Distinguish between real pollutants and carbon dioxide – carbon dioxide is a vital and necessary greenhouse gas crucial for plant growth and human survival. Make decisions based on sound science – not on blind belief or ideology which is increasingly divorced from reason. There is no point destroying our economy in pursuit of ‘carbon neutrality’ if carbon dioxide and other greenhouse gases are not driving global warming. “Global warming is a hoax – ACT Party leader”, September 2, 2008. “Why NZers should list vote ACT party”, September 7, 2008. “ACT Party leader says, “Drop ETS!”, September 29, 2008. All official measures of global temperature show that temperature peaked in 1998 and has been declining since at least 2002, and this is in the face of an almost five percent increase in atmospheric carbon dioxide since 1998. Global atmospheric temperature reached a peak in 1998, has not warmed since 1995 and, has been cooling since 2002. The science doesn’t justify it, the costs are large and there are no benefits. I trust that the national pride of New Zealand readers will not be offended that arguments first used against their “ETS”, have now been regurgitated to attack the Australian version. Recently, Alan Gibbs has remained in the background. And his name does not even appear anywhere on the New Zealand CSC website. But the Gibbs family makes up for that with a double appearance on the ICSC list of personnel. There Gibbs is listed as the first “policy advisor”. And his daughter, neuroscientist Emma Gibbs, is one of three directors on the administrative team. No doubt, Alan Gibbs has donated the wisdom of his advice pro bono, generous soul that he is. And, surely it would not be impertinent to suggest that one so generous to ACT New Zealand may also have had some NZ dollars to spare in support of the hard work of the phalanx of other Coalition advisors and administrators. But that’s a question best put to ICSC Executive Director Tom Harris or New Zealand CSC Honourary Secretary Terry Dunleavey. Or else to Alan Gibbs himself. This entry was posted in Climate change "skeptics", Climate science disinformation and tagged ACT New Zealand, ACT Party, Alan Gibbs, Bob Carter, ICSC, International Climate Science Coalition, New Zealand Climate Science Coalition, New Zealand CSC, Rodney Hind, Tom Harris. Bookmark the permalink. Looks like “climatescienceamerica” is just another denialist blog. Same small coterie of *other* denialist blogs… These guys need a new act. I’m book-marking this, I knew ACT was dodgy, but damn. Though being a Kiwi, I’d argue that ACT’s performance last election was more due to public disillusionment with the Labour coalition and riding on National’s coat tails. [DC: I defer to your obviously superior knowledge of NZ politics. Not to my knowledge DC, though since I’ve only just started following Hot Topic and a few other kiwi blogs, so not fully in the know on what’s been dug up on ACT/National links to climate change denial groups. And I don’t recall ever hearing about this stuff on the only investigative journalism show Sunday, or the major news-papers unfortunately. The discovery of the 7-month lag is useful data that can improve measurement of retrospective trends. The excess claims are of no consequence in the long run. Lag correlations (Fig. 6) suggest that the maximum influence of ENSO on land surface conditions lags the ENSO index in the tropical Pacific by about 6 months. A pithy comment on McLean et al has been submitted to JGR by a number of big names: details and abstract here. To say that the political party ACT “won five seats” in the New Zealand parliament may mislead those not familiar with our unfortunate, relatively new, electoral system. ACT won one seat – Remuera, a territory ceded to them in effect by the National Party member Richard Worth (who, in the light of his much more recent victimisation in the media, may have been blackmailed into doing so). Winning this one electorate entitled ACT to a fraction of the MPs implied by the votes they’d got in the 2nd (list) votes. Meanwhile, another party which got treble their vote but won zero electorates got no MPs. That’s the version of proportional representation we now have (based on one contrived for Germany soon after W2 by USA academics to prevent any party gaining control).